Whether you are suffering from a sport or spine injury or a complex neurological condition, we have all the skills and tools necessary for each stage of your recovery. Chiropractic is a health care profession that focuses on disorders of the musculoskeletal system and the nervous system, and the effects of these disorders on general health. Chiropractic care is used most often to treat complaints, including but not limited to back pain, neck pain, pain in the joints of the arms or legs, and headaches. Chiropractors practice a hands-on approach to health care that includes patient examination, diagnosis and treatment. During treatment, each patient receives a different level of force, direction and depth as an adjustment is performed. An adjustment describes many hundreds of ways and techniques of directed and controlled pressure to restore spinal segments to a more normal position and range of motion. This increases flexibility, movement and maximal performance. Dr. Chung performs a combination of all technique systems and will chose the techniques which will be most effective to achieve your goals. Neuro-orthopedic soft tissue therapy is a culmination of Dr. Chung's 20 years of experience in massage and bodywork. He combines techniques from functional neurology, myofascial release, Active Release Techniques, Zen Shiatsu and orthopedics. The therapy is a hands-on technique which integrates assessment and treatment of neuromuscular function, orthopedic and soft tissue dynamics while releasing soft tissue and joint restrictions as he takes you through passive and active movements. When combined with neurological evaluations we can detect and measure muscle tone and movement strategies as they reflect the various relay centers in the brain--identifying the cause of imbalances and injuries. Eye position and eye movements are unique in that they reflect the dynamic input between the reflexes within the inner ear and the central processing centers throughout the brain involving balance, coordination, visual processing and executive skills. Basically, the eyes are integrated with numerous regions of the brain. However, each type of eye movement is regionally controlled by specific neural pathways and lobes of the brain. This is important because eye movement training can be used to selectively target neural pathways in order to promote powerful change’s in one’s brain. NMR incorporates a wide-range of therapies and exercises designed to re-educate the brain's awareness and control of balance, movement and motor skills. Therapies may include passive and active movement training, visual-motor skills, balance training, mirror image therapy, cognitive tasks, visualization techniques, and much more. VRT is a therapeutic exercise model which incorporates specific movements and sensory-motor therapies involving the head, eyes and body. The types of movements prescribed will be based on the cause of your symptoms and the functional imbalances which were identified throughout your exam and testing. VRT has been shown to improve the symptoms caused by peripheral and central vestibular disorders by promoting central mechanisms of adaptation, habituation and compensation. Our clinic utilizes non-invasive neuromodulation techniques which work by actively stimulating nerves or sense receptors to produce a natural biological response without the use of drugs or piercing of the skin. The type of stimulus can consist of electrical stimulation, auditory frequencies, vibrational frequencies, light frequencies and biofeedback devices which promote self-regulation of biological functions, such as heart rate variability, respiratory rhythms, temperature and brain waves. These exercises promote function of the vagus nerve which activates your parasympthetic nervous system. This system is essential for regulating the cardiovascular system, digestive system and blood flow to the brain. Exercises often include diaphragmatic breathing, gargling, abdominal massage, vestibular rehabilitation, visualization techniques, non-invasive neuromodulation, and much more. Laser therapy is the non-invasive use of laser energy to generate a photochemical response in damaged or dysfunctional tissue. Laser therapy can alleviate pain, reduce inflammation and accelerate recovery from a wide range of acute and chronic clinical conditions. As rehabilitation specialists know, the main goal of treatment for many when treating painful, debilitating conditions is to facilitate improved function and mobility. Laser therapy is a drug-free, surgery-free technique to help make that goal a reality. Cleared by the FDA in 2003, Class IV Laser laser therapy has become standard of care for many musculoskeletal and neurology injuries. The Bertec Balance Trainer is a computerized posturography device which can objectively measure balance, postural stability and risk for falls. It's training modules can be used to strengthen one's balance, coordination, weight shifting abilities and postural reaction times. The training can be customized according to an individual's area of weakness while providing visual feedback and measurement of one's daily progress. Is the only rehabilitation device that has been developed to target and strengthen the 180 deep postural muscles throughout the spine. As one pushes and pulls against dynamic resistance it engages the reflexogenic systems which control balance, coordination and postural muscles as you receive visual feedback. 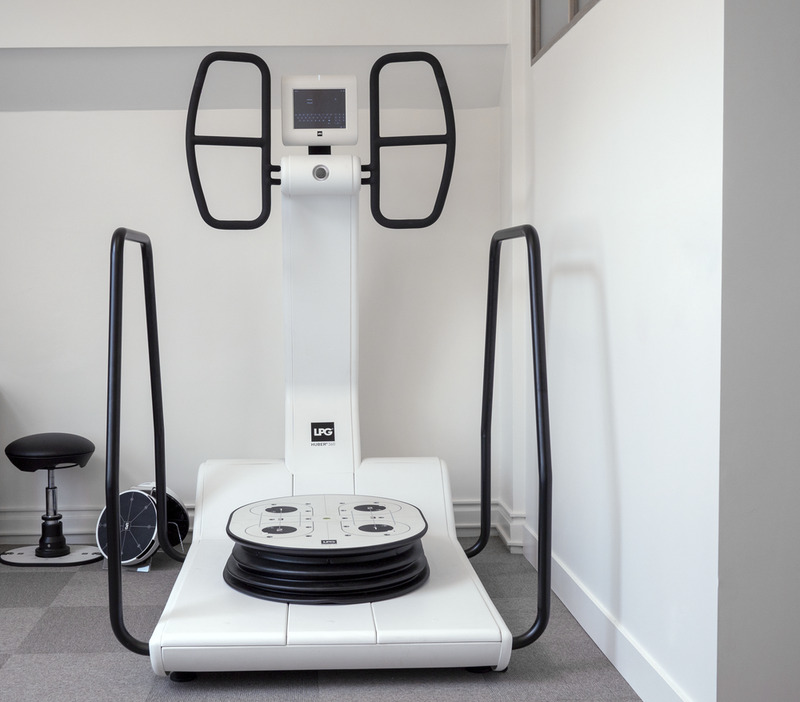 This machine is an excellent tool for spine rehabilitation, improving balance and vestibular disorders, and assisting with the recovery of numerous neurological conditions. A combination of hand-eye coordination exercises and cognitive tasks are designed to target an individual's areas of weakness and strengthen function of the corresponding neural pathways. This consists of eye movement exercises, hand-eye reaction speeds, interactive metronome activities, slow and fast eye tracking skills, visual-auditory sequencing, attention, memory, spatial awareness and more.